The proverb cutting right through a knight's move is very big is related to the idea of the split shape. is usually a very bad shape for Black, but it often happens as a result of a ko threat that was ignored (see e.g. There are No Ko Threats in the Opening). This shape is also discussed in Four basic shapes, part of a book by the chinese pro Fan Hui, where it is referred to as a ripped keima. Black might have the knight's move shape already in place, and a ko starts somewhere else on the board. Then White might play as a ko threat, Black might end the ko, and White could then play the stone marked with a square..
Of course, with two moves in a row locally, Black can plough straight through. The idea behind my proverb is that doing so is usually a very big play in actual game situations, and thus is sente and a big ko threat in many cases. When Black is permitted to cut, the damage is evident, though contrived. 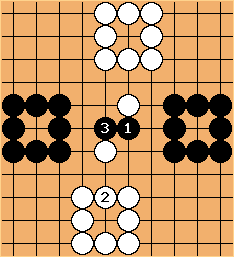 White is denied a connection between groups above and below (in the given diagram - the 'knight' is 'standing up'), which White previously was entitled to. Black is granted a connection between groups to the left and right which Black previously was not entitled to. 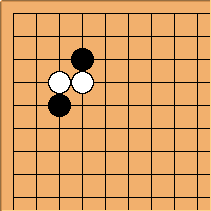 White's stones are placed badly; they're touching a stronger black group, and trying to support one white group lets Black target the other.